The only thing better than photographing Yellowstone, is photographing Yellowstone in the winter. If you can brave the cold, you're in for a very memorable photography trip where you're sure to capture a few portfolio pieces. I'm just returning from another trip to Yellowstone this last week with a group of 40 readers of Improve Photography, so winter in Yellowstone is fresh on my mind. IMPORTANT TIP! Since publishing this article, we created the ULTIMATE tool for planning a photography trip to Yellowstone. It's called Really Good Photo Spots. It's a free iPhone and iPad app with THOUSANDS of the best photo locations in the world all in one app. Nearly every country in the world has many spots. It's really convenient for travel photography because you can just tap “Spots near me” and BOOM! It lists all the best spots to take pictures near you. Download really Good Photo Spots for the iPhone or iPad right here. There is only one entrance to Yellowstone open to the public during the winter months–the north entrance near the city of Gardiner Montana. The guard station at the entrance opens at 8AM, but you can go in earlier as the gate is left open when nobody is there to take your money. You just pay when you leave if you go in early. Gardiner is a small town with only a few hotels (I personally like staying at the Best Western in Gardiner because they have an excellent free breakfast). Your hotel will only be a few hundred yards from the entrance. Once you enter the park, there is really only one road to follow that leads all the way to Cooke City (about a 2 hour drive one-way). You'll find wildlife all along the drive, but the hottest area for photographing wildlife is in the Lamar Valley (about a 1 hour drive from the entrance). But you'll probably stop for 10 or more photo ops on the way there as you run into wildlife along the road. It's helpful to have more than one person in your car so one person can focus on driving and the others can look out for wildlife. Some of the animals can be tough to spot. If you aren't a great spotter, don't worry. Just look for cars stopped along the road (you can't park on the road–must find a pullout) and you can see the wildlife the other cars spotted. I recommend leaving the hotel at about 7:30AM (breakfast at the Best Western starts at 6:30AM) so you can make it most of the way to the Lamar Valley by sunrise. There usually isn't enough light for wildlife photography until about 8:20 (sun rises around 8AM for most of the winter). So if you get an early start into the park, you can make it to the hottest areas as soon as there is enough light. On a typical day, if you're good at spotting the wildlife, you're likely to see 100 bison, 100 elk, 10 bighorn sheep (3/4 of them being rams), 3 coyotes, a pack of wolves from a long distance, a fox, and a moose. You'll also likely see bald eagles, which are abundant in Yellowstone but difficult to spot amongst the landscape which is spotted with snow. Oh, and plenty of deer. If you're extremely lucky, you may spot a bobcat or a wolverine, but that's a very rare day. You can't get too long of a lens for shooting in Yellowstone. On both of my last two trips I shot with 600mm lenses, and while I did find myself zooming out for a few very close encounters, 90% of my shots were at 600mm and sometimes I wished for 800mm. 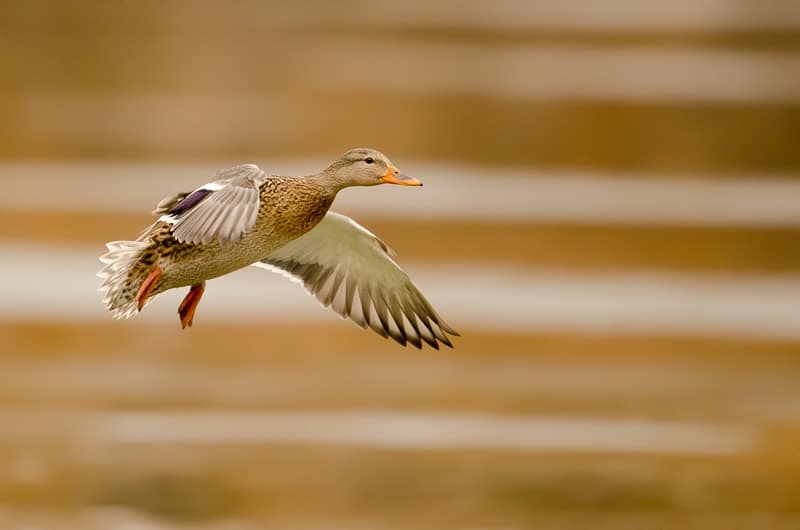 The first time I went, I used the Nikon 600mm f/4. Yep, the HUGE lens! I got some great shots, but on this trip I used the Sigma 150-600 Sport and Contemporary lenses as well as the Tamron 150-600 (I had all three to test them for a review on the site). Frankly, I got better pictures with the far less expensive handheld 150-600mm lenses than I did with the huge 600mm f/4. Why? Because I could handhold for much of the time and that helped me to move around more and get interesting perspectives. When you're locked onto the tripod, it's a lot of work to move around, so often I find that I don't do it. The one stop of more light from the 600mm f/4 or tiny bit of extra sharpness was not worth as much as the agility of the smaller wildlife lenses in my opinion. You'll also want some good clothing of course for the extremely cold conditions. Most photographers turn up their noses at photographing coyotes–not me. 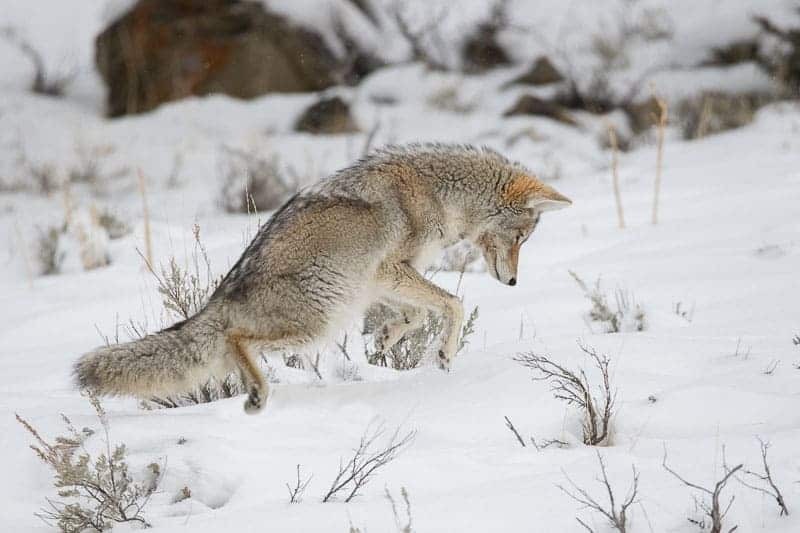 The coyotes in Yellowstone during the winter are some of the most fascinating animals to watch. With their gorgeous full winter coats, they look stunning against the bright white snowy landscape. Coyotes feed themselves in the winter by mousing. They sneakily walk around the snow and listen for the tiny squeaking noise from a mouse. When they hear it, their whole body stiffens up and they suddenly spring into the air and dive head-first into the snow to grab the mouse. It's more entertaining that Netflix for sure 🙂 The good thing is that this is an easy behavior to capture in Yellowstone. If you spend a little time during your trip watching for the coyotes, you're sure to get a shot of this. 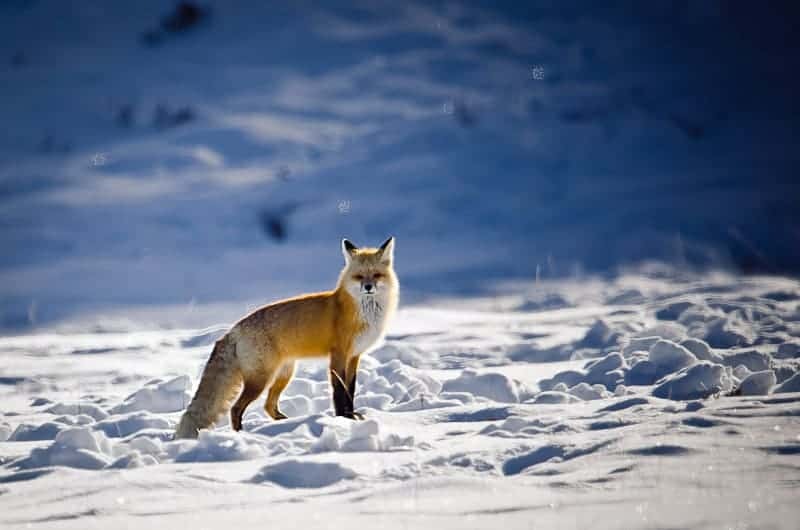 Foxes are abundant in Yellowstone, but far more skittish than the coyotes. Whenever I spot a fox in Yellowstone, it's only a brief encounter as it starts running away. But if you look carefully you're likely to see about one fox each day. When you see it, jump out of the car quick and shoot because it won't stick around for long! Bison and Elk are undoubtedly the most commonly-seen animals in Yellowstone. You're certain to see 200 in a day. Unfortunately, the fact that these animals are so common often makes photographers turn up their noses at the bison and turn their attention to the more rare animals. As far as I'm concerned, that's a mistake. In the winter, the bison are arguably the most beautiful animals in Yellowstone with the bright white snow contrasting against the deep, dark hair on their heads. The bison spend plow away the snow with their massive heads (“It's like watermelon on a toothpick” if you know that movie quote). So the snow gets all over their heads and it makes for a gorgeous shot. Just remember to have a respect for both the elk and bison in Yellowstone. Bison may look like glorified cows, but they are the most dangerous animals in the park if you get too close. Bighorn sheep are abundant in the park, but they always travel in small herds so you won't run into them constantly. That said, you'll surely see a couple small groups each day. 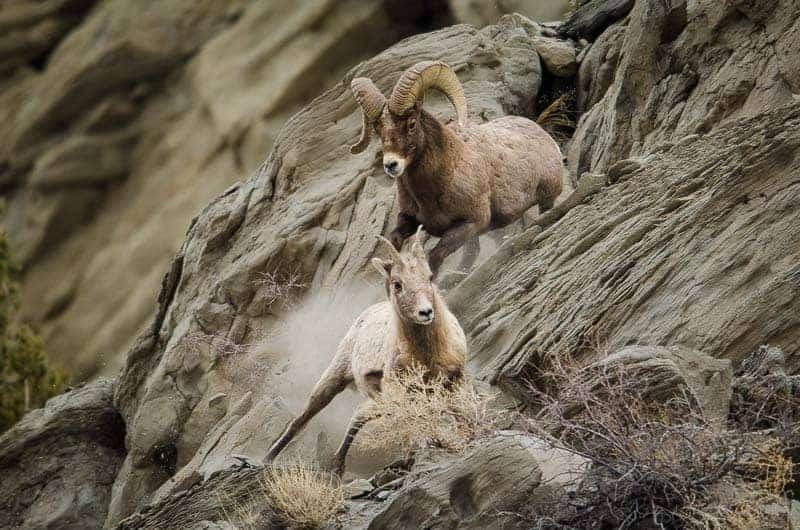 Winter is an excellent time to see the bighorn sheep fighting, but it's something that takes patience. The sheep will sit around doing nothing for an hour or two, and then all of the sudden you'll see a ram run over to one of the ewes. 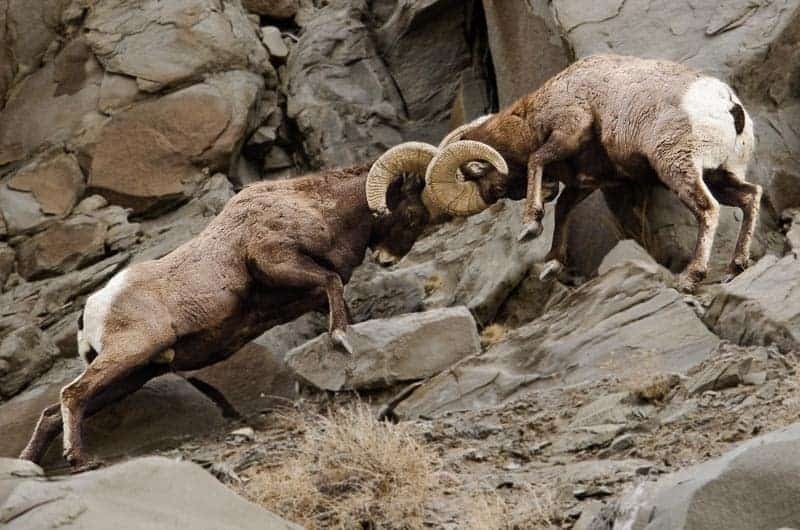 The other rams won't like the ram stealing their woman, so they'll go fight. Sometimes the head locking can go for 30 seconds or a minute, and sometimes it will just be a fleeting second where they lock horns. In Yellowstone during the winter, getting the fighting shot takes patience. Just don't let down your guard or you'll miss the action. If you really want the ultimate shot of bighorn sheep, I recommend spending 10 or 15 minutes with a couple herds your first day. Watch them carefully. See which herds are more active. Then go back the second day at the same place and time (they'll likely be in the same area) and wait for the ultimate shot. Bighorn sheep are not skittish at all. You can park your car quite close to them and shoot comfortably without them worrying about you. It's easy to get a nice tight face shot, but I recommend waiting until it does something more interesting than just staring at the camera. Photographing the wolves in Yellowstone is pretty tough. You're certain to see wolves, but they are usually much too far away to get a shot off. Most of the photos of wolves in Yellowstone are shot through spotting scopes with cell phones mounted to the eyepiece to get a snapshot. You'd be incredibly lucky to see a wolf close enough to fill the frame with even the longest of supertelephoto lenses. The easiest way to see the wolves is to drive along the road until you see cars pulled off the side that have long radio antennas on their vehicles. These are the biologists who follow the wolves' every move and use the radio antennas to locate their radio collars. Go see the wolves at least once during your trip, but if you want great photos, don't spend all your time trying to get close to a wolf. It's unlikely to happen and you could spend your whole trip chasing them without luck. Bobcat are sometimes seen in the park, but they are much much harder to spot if you don't know where one is hanging out. Weasels are pretty common in the park but their white fur against the white snow makes them very hard to spot. Wolverines are in the park, but you'd be extremely lucky to see one. 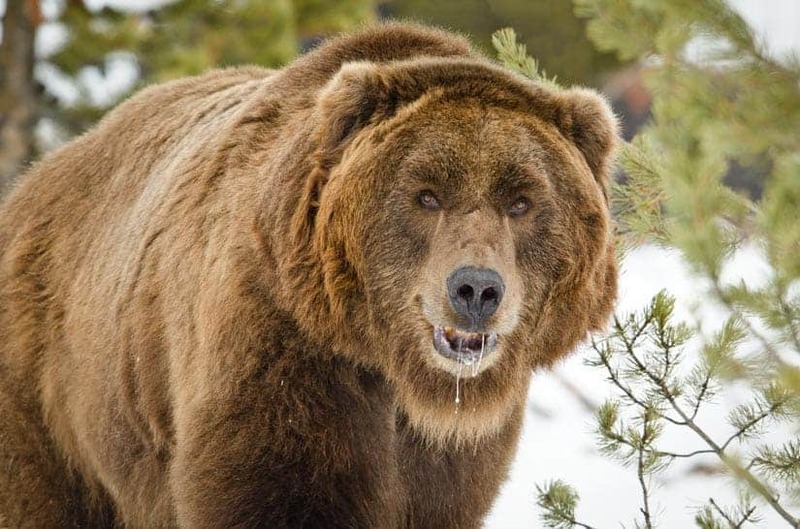 If you are driving down out of the park through Idaho, I highly recommend stopping at the Grizzly and Wolf Discovery Center in West Yellowstone. They have wolves and bears that you can photograph up close, and unlike zoos, the park lends itself well to photos by placing the animals in natural-looking environments. Some people don't like shooting animals in captivity, but I don't mind one bit. It's just important to be honest and not tell lies about how a photo was taken. One cool thing about this spot is that, according to the person I talked to, they allow professional photography in the park. You can bring in a big lens without issue, and the lady told me that they don't even mind commercial use of the photos, but I'd check on that one. I asked if there was a special fee for photographers (there usually is) and she said they don't do anything like that and the manager confirmed. I'd check again on that, but that's what they told me when I went. Personally, I'm VERY happy to see a place that is friendly to professional photographers. I've sent dozens and dozens of photographers there because they don't charge extra and let you use the long lenses. The temperature in Yellowstone in the winter ranges from cold to “My nose hairs froze in less than 30 seconds” cold. It completely depends on the year. Usually, you'll find temperatures in January at a high of 20 degrees farenheit, but many times the temperature never reaches 0 degrees. The factor that controls the experience most is the wind. It doesn't take a very cold temperature to make it miserable if there is a strong wind. One year I was in Yellowstone in January and there was almost no snow at all. Other years I can barely stand outside the car for a full minute without feeling the pain of cold. Be ready for anything and check the weather right before you go. I always stay in the Best Western in Gardiner because they have a nice big free breakfast in the restaurant next to the hotel each morning. It's big enough that I can skip lunch while shooting in the park, which ends up saving quite a bit of money. The hotel is clean but dated. Hotel staff has always been courteous in my experience. I'm sure there are lots of good places to stay, but that's always where I've stayed and they've kept me happy. As for restaurants, there are only two or three open during the winter. One is the restaurant next to the hotel, and the other is K-Bar Pizza, which is quite good. You might consider a guided tour while you're in Yellowstone, but I have a couple cautions. The first year I went, I hired a guide to take us through the park to find animals. Bad move. He was an extremely knowledgeable biologist, but all he did to find animals was drive down the road and pull over when he saw cars parked looking at an animal. Also, he wasn't a photographer so he would keep stopping and pulling out a spotting scope to show us ant-sized wolves a mile away–not very helpful to a photographer trying to get a nice tight shot. He also didn't stop (even though we asked a couple times) to shoot bison or other more common animals. He talked our EARS OFF all day about wolves, but wasn't a helpful photography guide. I have not done the snow coach tours in Yellowstone, but several from our group did. They only got mediocre results and most of them said it wasn't worth the money. The snow coaches took them to the geysers, but the problem with shooting the geysers during the winter is that they produce so much steam that you can't even see the pretty colors in the water through the steam. So they weren't very happy with the photography results. I just have a couple tips specific to shooting in Yellowstone, first of all, PLEASE PLEASE PLEASE read my article with 11 tips for long lens technique. It will teach you a lot of helpful things I learned while shooting in Yellowstone. But the other tip which is very important is to make sure you get to ankle height on animals when you're photographing them. In Yellowstone, the roads are often up about 10 feet higher than the terrain, so you're often shooting down to the animals, and it doesn't make for a very captivating shot. Every time I go, I waste the first day's pictures by not getting down on the same level as the animals, and the photos lack that intimacy and natural feel of shooting from slightly below the animal's eye line. Do everything you can to get to ankle height on the animals before you shoot and you'll have much better shots. I blogged each day of my trip to Yellowstone a few years ago. To get more of a feeling of what the trip is like, along with more of my shots, read it here: Day one, Day two, and Day three.